Judging will begin promptly at 9:00 AM on Saturday February 23, 2019. Registration will start at 8 AM — please be on time. Preliminary judging will be scheduled depending on the number of entries and judge availability. Late entries and walk-ins will only be accepted by decision of the Organizer. Judges and Stewards are urged to indicate their offer through the Registration site, along with which sessions are of interest, and style preference. The competition is limited to 425 Paid Entries. Please be aware that an entry might be registered but still not qualify for the competition because payment was not completed before the competition limit was reached. This Event will be sanctioned by the AHA and judged using the 2015 BJCP Style Guidelines. Detailed style descriptions may be found on the BJCP webpage. Entries will be accepted in all categories this year with a separate Best of Show for Cider/Mead. Entrants may enter up to 8 beers as they like but are restricted to one entry per sub-category. Entrants are responsible for placing their beer in the proper category. No entry will be reclassified. Some categories may be combined at the organizer's discretion. Entries in combined categories will be judged according to the style originally indicated by the brewer. We are proud to be a part of the MidSouth Series which is Mid-South Homebrewer of the Year and Club of the Year. This will be the second competition of the 2019 series. Those interested in being a volunteer judge or steward should indicate the offer on the Registration site, along with which sessions are of interest. Judges are also asked to indicate if a hard-copy of the Style Guidelines would be needed. If you plan to use an electronic copy of the Style Guidelines, please mark no hard-copy needed in order to reduce the number of Style Guidelines that need to be printed. Save a tree. Volunteers are needed for all of the preliminary judging sessions as well as on the day of the competition. Lunch or Dinner will be provided for judges and stewards, coffee and donuts/bagels will be provided the morning of the competition. Judges for the Peach State Brew Off cannot judge in any category they have entered. 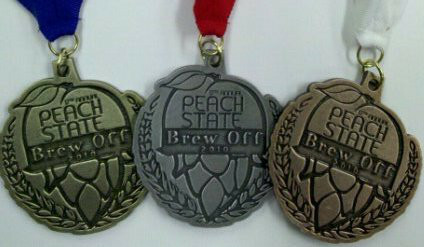 Stewards for the Peach State Brew Off cannot steward in any category they have entered. BJCP Points will be awarded to judges and stewards through the BJCP Organization according to their guidelines. Any questions about judging should be directed to the Judge Coordinator, Ryan Boling. Any questions about stewarding should be directed to the Head Steward, Ashely Boling. Any questions about the People's Choice Award should be directed to Scott Lathrop. All other inquiries should be directed to the Organizer, Kimberly Charles. The Peach State Brew Off is open to all homebrewers regardless of their location. Beers brewed by two or more individuals must list the names of all involved. No commercially brewed entries will be accepted. Entry fee is $10 per entry. Brewers will be limited to 8 entries. The entry limit of group brewers are considered separate from the limits of individual brewers. Each entry must consist of two (2) food safe containers that hold a minimum of 10 ounces (296 ml) by volume. The container must be no more than 2.75 inches (7 cm) in diameter and no more than 9 inches (23 cm) in height, to ensure that they will fit in standard longneck case box slot. The container must be free of ink, paint, or paper labeling other than the competition entry label. Any lettering or graphics on the cap must be obliterated with a permanent marker. Entry labels must be securely attached to each bottle with a rubber band. Labels that are taped or glued to the bottle will be disqualified. Entry fees for disqualified entries will not be returned — please follow the instructions. Payment can only be made through PayPal. Entries will be accepted at the drop-off locations from Saturday December 29, 2018 to Saturday January 19, 2019. No entries will be accepted at drop-off locations after January 19, 2019. Entries will be accepted at the shipping locations from Saturday January 5, 2019 to Monday January 21, 2019. No entries will be accepted at shipping locations after January 21, 2019. Walk-in entries will only be accepted at the sole discretion of the Organizer and only with prior arrangement. Late entries will not be returned. All entries must be registered through the online registration site. The Online entry registration is available from December 29, 2018 through January 20, 2019. Entries can be dropped off at the following locations. Entries can be shipped to the following location. The Soiled Virgin Sandal Fruit People's Choice will be conducted during the Awards Ceremony and Raffle. There is no separate entry fee to be considered for this event. There are no style guidelines to adhere to. Just print out the Transport Permit Label and attach it to the keg. To enter, bring a keg, or several bottles, just make sure to bring enough for everyone to get a sample. No advance registration is necessary, but a permit label is required. The Transport Permit Label will be available closer to the event date. Entries will be accepted on the day of the competition only. If you bring a keg, please remember to provide a gas source and a tap. There should be no expectation of having any equipment available unless prior arrangements have been made. The winner will be selected by popular vote from the people attending the Award Ceremony and Raffle. Winner will receive a commemorative plaque acknowledging the accomplishment. Last year was great, but no reason not to make it better. This year, let's ramp it up! Make it crazy, or make it sane. Pull out the special kegs!!! Results will be announced at 1:00 PM on Saturday February 23, 2019 at Little Tree Art Studios. Medals will be presented to 1st, 2nd, and 3rd place in each flight during the Awards Ceremony in conjunction with the Raffle while the Best-of-Show session is being conducted. BJCP categories may be split or combined depending on the number of entries received in each category. The Ale Grail is presented to the Georgia Homebrew Club with the highest point total. In the case of a points tie, the Ale Grail will be presented to the club with the most first place entries. First Place Best of Show receives a commemorative plaque and a hand-made commemorative chalice. Second Place Best of Show receives a commemorative plaque and a hand-made commemorative chalice. Third Place Best of Show receives a commemorative plaque and a hand-made commemorative chalice. First Place Mead/Cider Best of Show receives a commemorative plaque. People's Choice Award will receive a commemorative plaque. 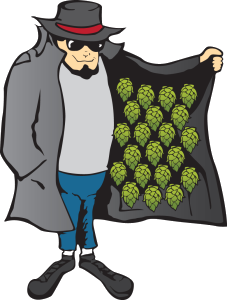 We will make every effort to post the results at the Covert Hops registration site on the day of the event. Score Sheets will be available for download from the site shortly after that. An email will be sent to the registered email address when the score sheets are posted to the registration site.